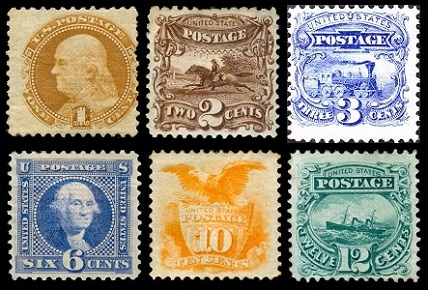 In early 1869, a new series of US classic stamps (Sc. #112-22), featuring new pictorial designs, was introduced. Several of these new US stamps were even printed in multiple colors, a difficult undertaking, considering the limited multi-color printing capabilities of the 1860's. Unlike previous definitive stamp issues, these new stamps are smaller and square in shape. They are all shown in the two images above. Due to their smaller size, the 1 Cent through the 12 Cent denominations were printed in panes of 150 instead of the panes of 100 used for previous definitive stamp issues. 01 Cent - Benjamin Franklin. 02 Cent - Postman riding a galloping horse. 06 Cent - George Washington. 10 Cent - Shield and Eagle. 12 Cent - Steamship - S.S. Adriatic. 15 Cent - Painting - "Landing of Columbus". 24 Cent - Painting - "Declaration of Independence". 30 Cent - Shield, Eagle, and Flags. 90 Cent - Abraham Lincoln. There are two types of the 15 Cent denomination. The first type (Sc. #118) DOES NOT HAVE a FRAME around the painting. The second type (Sc. #119) HAS a FRAME around the painting. The practice of embossing the sheets of stamps with grills, to prevent their being cleaned and reused, was continued with these new US classic stamps. The grill used on these is the "G Grill", which measures 9 1/2 x 9 mm and has 12 x 11 grill points. 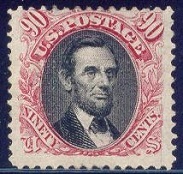 There are many grill embossing errors on these issues, as well as stamps with "missing" grills. According to the Scott Catalog, the stamps with missing grills can only be authenticated by collecting MINT examples with ORIGINAL GUM. 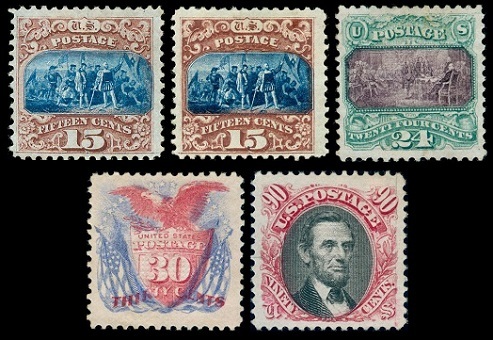 As the different colored parts of the designs on the 15 Cent, 24 Cent, and 30 Cent denominations were produced in separate printing operations, one would have to assume there would eventually be errors, such as passing a sheet of stamps with the printed frames upside-down through the press that printed the vignette designs! With this manner of printing, all three of these stamps exist with "inverted centers". This did not happen often though. All three of these errors (Sc. #119b-121b) are exceedingly rare, and they are seldom offered for sale, outside of major public auctions. 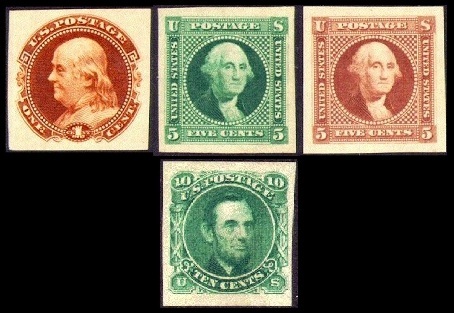 In 1870, these short-lived pictorial US classic stamps were replaced by larger size definitive stamps depicting portrait busts of prominent Americans. In 1875, the National Banknote Co. made reprints of the 1869 issue for collectors (Sc. #123-132). The reprints were produced on hard white paper with crackly white gum, and they did not have grill embossing. Except for the 1 Cent denomination, they are all very scarce. In 1880, the American Banknote Co. also made similar reprints of the 1 Cent denomination (Sc. #133), in buff and in brown orange, on soft porous paper. They are much more common and are relatively easy to find.